Being able to sleep well on your bed doesn’t have to be complicated. Most mattress companies and sleepers have recognize that a “firm” mattress might play an important role to waking up feeling energized and refreshed. Even more important, firm mattresses are important for the health of our spine. So what exactly makes a good firm mattress? Do they really help with back pain? 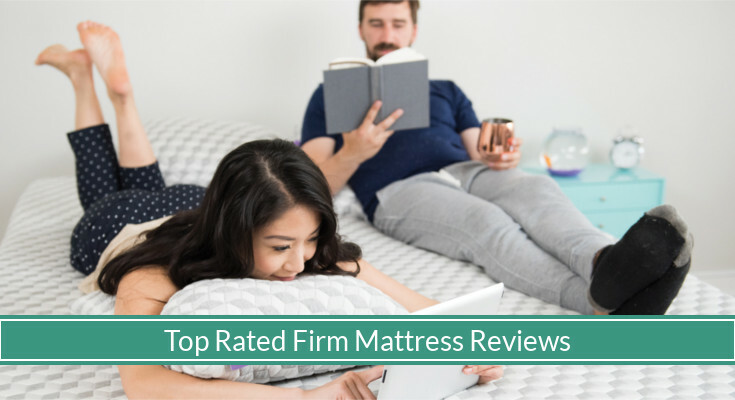 In this buyer’s guide, we will take a look a closer look at those two questions and share out reviews on the top recommended firm mattresses on the market. 1 Does Firm Mattress For Back Pain Work? 2 What Makes A Great Firm Mattress? Does Firm Mattress For Back Pain Work? Firm mattress can help improve back pain, depending on where the pain is coming from. Certain health conditions such as arthritis and scoliosis, as we mentioned in our guide comparing firm and soft mattresses, can have a difficult time and be made worse. For those with muscle-related back pain, either from strenuous activities or awkward sleeping positions, a firm mattress does provide a stable and leveled sleeping surface that can take tensions off the back. Firm mattresses can also provide the support your spine needs to maintain its natural curves, without any unnecessary curving from lack of support that soft mattress may not have. This means a mattress that can provide a cushioned, restful surface with full contact for the body posture to be neutral and natural. Actually firm, but supportive. Quite often we hear mattresses are “too firm”. There are several reasons behind that outside the control of the mattress (for example, the base where the mattress is placed or the personal preference and health condition of the individual). However, for the ones that are firm, there has to be some “give” to the mattress. This means the sleeping surface allows some degree of sink in order to support the curves of our body. On the other hand, we don’t want a mattress that is too soft for us. The lack of “flatness” to the sleeping surface means less body support, allowing the body to get into uncomfortable sinked-in postures. The last thing we want is to wake up feeling aches and pain! A firm mattress, well-built in construction and with quality material can provide us the firmness and support we need each night. High-density base layer. This can come as a high-density foam base or quality spring coils. The support from a foam base or the buoyant (upward) force of quality spring coils provide a cushioned surface for the top layers of a mattress to work its magic. It also ensures light weight or heavier individuals can get the deep compression support they need to prevent sinking. A trial period long enough to test run the bed. Firm mattresses may be “too hard” when they are first slept on. It’s important to spend time on the bed until the mattress “loosens up” to the way it will feel for the next several years. The only way to break in the new mattress is to have enough time to try it out without worrying about whether we can return it at a later date. Most mattresses on a low price class especially the ones we recommend from Amazon have a minimum of 30 days. The more expensive models provide 90-night trial periods and upward (or in some cases, an entire year like this and this mattress), which gives shoppers a lot of wiggle room to decide on the next mattress they will spend the next several years on. Warranty to protect against defective products. Even firm mattresses built to withstand pressure each night can suddenly sag. Having a warranty to back up your mattress can help ensure your bed will be of quality and use for as long as the warranty date. Inexpensive firm mattresses may have 1 to 5 years in warranty while higher priced ones can have 10 years or greater. We have also found the warranty terms of cheaper mattresses to be significantly less helpful than more expensive ones, so we wouldn’t count the warranties of inexpensive beds. The Layla Mattress is one of our all-time favorite beds. Built with a reversible design with two firmness levels to choose from, the Layla is built to be super supportive. The infusion of copper into the memory foam layers provide a slightly faster responsiveness to the typical memory foam sleeping surface. Copper provide a new property and density to memory foams. As a conductive metal by itself, its inclusion provide a cooler sleep by being more sensitive at absorbing heat build up. The copper infusion coupled with a breathable, gel-infused cover plus a convoluted inner layer for better airflow, we end up with bed that is much cooler than most mattresses can bring on the market. The great thing about copper for a firm mattress, and in Layla Mattresses in particular, is that it also provides more density and a firmer response for deeper compressions. The Layal Mattress comes with a lifetime warranty to cover for any product defects outlined. It also comes with a 120-night (four months) trial for a sufficient time to break it in, test both sides, and get comfortable. The mattress is made in the USA and comes with free shipping. If you’re not happy with the mattress, Layla will work with you to have it picked up and donated to a local charity then issue you a full refund. The Latex For Less Mattress is a double-sided, all-natural latex mattress. Ranked as one of our best recommendable organic mattresses, it’s built with 100% pure wool and 100% pure cotton with 100% pure latex inside and out. This mattress is built with a simple two-layer inside, with one layer to provide a firm cushion sleeping surface and the other layer a softer sleeping surface. Figuring out what mattress firmness is suitable for you can be difficult, so having a reversible mattress with two different comfort levels to choose from can help. Inside the Latex For Less, we find a dunlop latex layer and a tatalay latex layer. Dunlop is an older, classical construction for latex where it is typically much more denser and firm compared to tatalay. Dunlop latex also offer better moldability, giving a contouring support that conforms to the curves of your body. Tatalay, on the other hand, is much more softer and lighter, providing better responsiveness than dunlop as well as a little more give. With a label indicating which side of your mattress if firm and softer, you can pick and choose which surface is best for you. The mattress when ordered comes with free shipping. In the case that you aren’t satisfied with the mattress, Latex For Less will arrange to have it picked up from your home for free. You get a trial period of 120-nights, which is four full months to break in and test run the bed to your liking. It comes with a 20-year warranty that also protect you from any defectiveness of the mattress. It also works on all types of foundations and is flexible for use on adjustable beds. 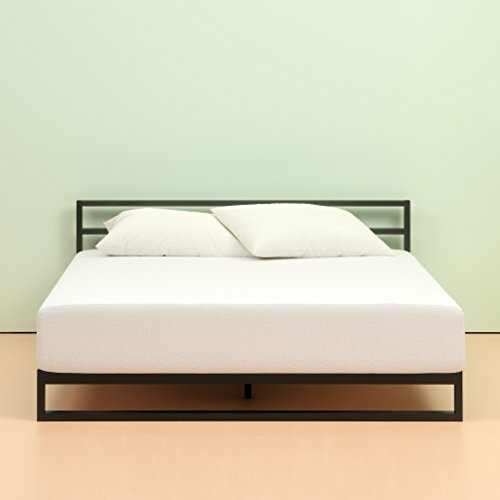 Arguably one of the cheapest, quality mattresses on the market, the Zinus Green Tea Mattress is a memory foam bed that can come in a wide range of firmness. As a general rule, the thinner the mattress, the more firm it can get as there is less cushion between you and the foundation your mattress is placed upon. 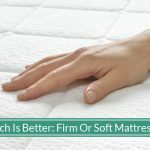 We recommend either the 8-inch as a firm choice, but if you have tried many popular mattresses and still want a much firmer mattress, you can choose the 6-inch. The Zinus has one of the more unique ingredients infused into its memory foam: green tea. It uses green tea extract as well as castor natural seed oil and charcoal to help reduce odor and bacteria build up in the mattress. There is an initial odor as with any memory foam material, but after letting it sit and air out for a week or two, the off-gassing chemical smell should be minimal if not gone. The mattress is CertiPUR-US certified for low chemical emissions and safe use. Depending on what thickness you choose, you can find two or three layers of foam. The top layer will always be the green tea memory foam, while underneath we have a comfort foam layer and a convoluted bottom base layer for support. A convoluted design provide airflow within the mattress for better breathing and better temperature regulation of the sleeping surface. The mattress comes with an Amazon-backed 30-day return policy. The Zinus Green Tea does a decent job for a very inexpensive mattress for providing a firm surface to sleep on. If you have a small budget for purchasing your next mattress, the Zinus Green Tea will give you what you the support you need for a firm sleeping surface. 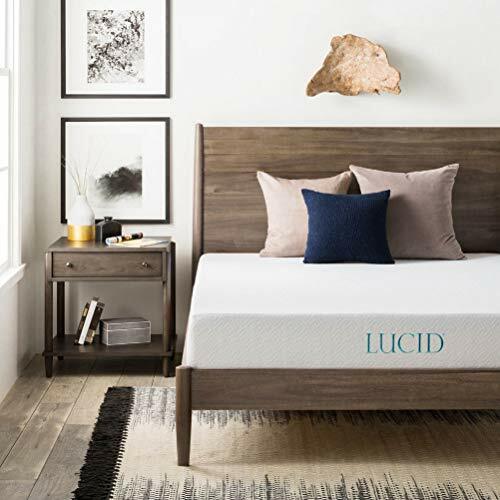 The Lucid Mattress is another memory foam based mattress that can provide an inexpensive bed that is firm and comfortable for rest. Fully infused with cooling gel, the mattress provide a contouring, “hugging” support that can help even the most sensitive of sleepers. If you find yourself with pressure points along your body as you rest, the Lucid Mattress can help alleviate that pain. It comes with multiple thickness to choose from ranging between 6 inches to 12 inches. We recommend the 8-inch thickness for a firm sleeping surface, but if you find yourself in need of the firmest mattress possible, the 6-inch will provide the best firm surface. The top layer of the Lucid Mattress is made with memory foam fully infused with gel particles. Memory foam tends to be hot because of its hugging effect for pressure relief. The gel particles helps provide a cooler sleeping surface by absorbing heat build up that can get trapped underneath. The layer is also aerated (has air holes) that help the mattress breathe better as you naturally shift around in your sleep at night. Below as a base layer, we find a high-density regular foam material to provide the mattress its shape and deep support for your body. The mattress comes with an Amazon-backed 30-day return policy. 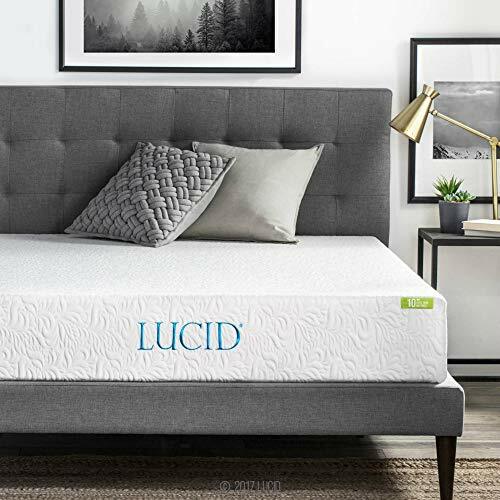 The Lucid Gel-Infused Mattress is another decent, low price class mattress if you need a firm bed that won’t break the bank. If you are a hot sleeper or live in a warm climate, this mattress can help take away some heat for a cooler rest. 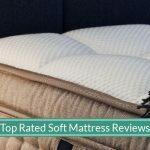 Another Zinus Mattress makes the list! The Ultima Comfort Mattress is an inexpensive euro-top innerspring mattress that can provide a firm, supportive sleeping surface thanks to a multi-layer, high-density set of foams on top of individually encased pocket coils. As with most pillow top beds, the Ultimate Comfort euro-top does provide some decent amount of cushion to help with common pressure points. For example, side sleepers who enjoy the bounce of innerspring beds do apply a significant amount of pressure on the arms, shoulders, and neck. With a padded euro-top, the sleeping surface is given more cushion to absorb the weight of the body and allow it to comfortably rest on top. Inside the mattress, we find several layers of foam on top of independently wrapped steel coils. The 8-inch does only have one layer of 1-inch thick foam, but the 10-inch, 12-inch and 13-inch have greater than 2.5-inches of foam for providing a consistently flat surface while feeling much less of the steel coils. Multiple layers of foam provide more cushion, as each layer contain space between them. The coils are 12-gauge, where most mattresses use 13-gauge for a supportive surface. The lower the gauge, the stronger and firmer the steel coils. This means the Ultima Comfort provide one of the more firm sleeping surfaces that innerspring mattresses can offer. The Zinus Ultima Comfort comes with an Amazon-backed 30-day return policy. If you enjoy a bouncy sleeping surface, and need an inexpensive firm bed, then the Ultima Comfort can be a good choice. You won’t have a sinking effect that makes you feel “trapped” that most memory foam mattresses do, and have a significantly better responsive sleeping surface that won’t leave body impressions as you naturally toss and turn at night. Heavier set sleepers can also benefit from the strong coil support. 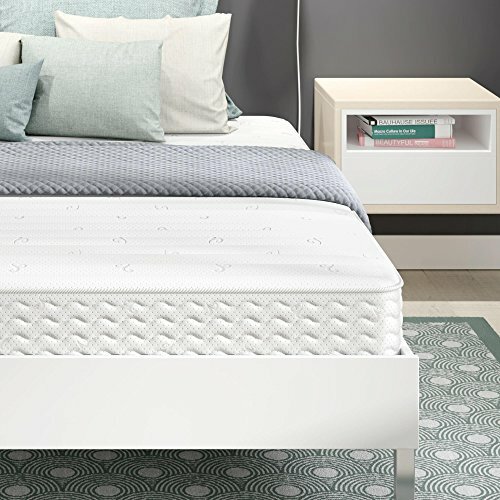 The Signature Sleep Contour Mattress is another inexpensive innerspring bed, but with some important differences compared to the Zinus Ultima Comfort. The coil gauge is much higher, providing a significantly better give and sink (suitable for slimmer, lighter-weight sleepers in need of pressure relief) with a tight top (for those who aren’t a huge fan of euro-top padding). If you enjoy innerspring, but maybe want to use a slightly less firm mattress, then this bed is for you. Inside, we find our important distinctions. Most innerspring mattresses built to for a softer sleeping surface will use 15-gauge steel coils. The higher the gauge number, the more give the coils will have when pressure is applied. But we don’t directly sleep on the coils themselves. The Signature Sleep Contour uses high-density foams at the top and bottom of the mattress. Regular foam, unlike memory foam, is more responsive and can maintain its shape better under pressure (while memory foam is highly moldable and conforming). The high-density foams provide a firm sleeping surface, while the innerspring base layer give you the sink, cushion, and bounce that make beds so fun to jump onto then fall asleep on. The reversible design of the Contour also give sleepers a chance to even out its wear and use, giving it a longer lifespan. The mattress comes with an Amazon-backed 30-day return policy. The Contour is available in either 8-inch or 10-inch (we recommend the 8-inch as the firm mattress choice). If you want an innerspring that is reversible, we can’t find a better mattress than the Signature Sleep Contour. The Lucid Latex Mattress is another great recommendation for a firm mattress if you enjoy latex. 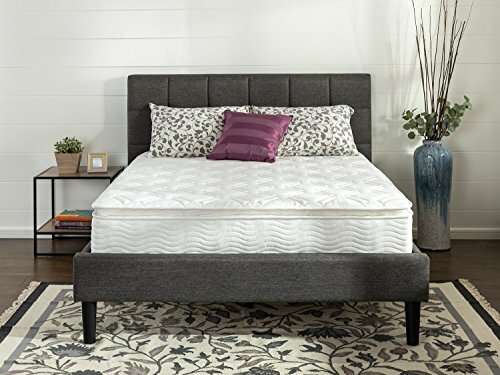 This mattress is moderately priced (on the lower end) and uses an all-natural top layer latex that provide a responsive, bouncy foam comfort feel. The mattress is naturally hypoallergenic. As a thick latex top layer, the bed can provide a better temperature, regulated sleeping surface. Latex is highly durable as well with greater elasticity than other types of foam. The top layer is also aerated for better breathing of the mattress. With air holes, heat and air can better circulate and dissipate without getting trapped. Underneath the latex layer, we find deep compression support with a highly dense foam base layer. if you enjoy latex beds, but want to something affordable and firm, then the Lucid Latex Mattress does the job. As latex foam, it conforms well to your body weight and body curves to relieve pressure, while providing a firm sleeping surface that prevent your body from sinking uncomfortably deep into the mattress.